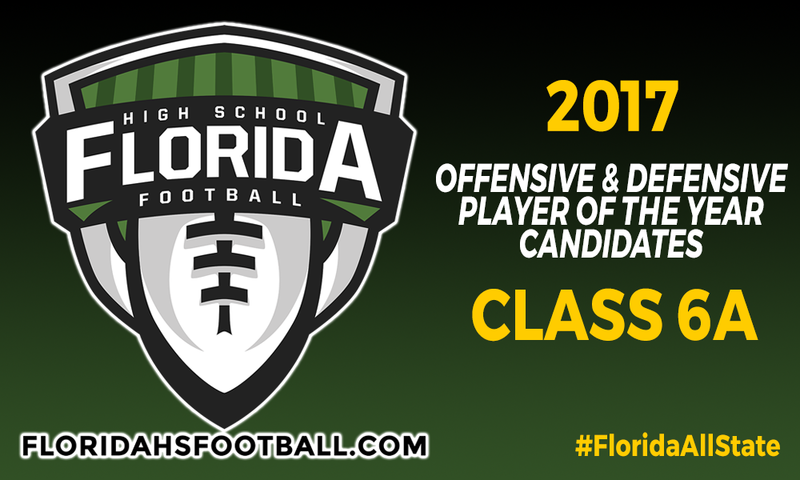 GAINESVILLE, Fla. — With the final step to fully closing the 2017 season is almost here, we are proud to reveal our candidates for our Class 6A Player of the Year candidates. For Coach of the Year, five coaches are selected as candidates based upon the resume they had for the season. For Player of the Year, three players are selected on offense and three on defense as candidates for Offensive Player of the Year and Defensive Player of the Year. One player from each classification of the six candidates total will be selected as the Overall Player of the Year for their respective classification. • QB Austin Reed, Sr., St. Augustine – The leading passer in passing yards and touchdowns in the state this season, Reed made the most of his senior year throwing for nearly 3,000 yards (2,925) and 34 touchdowns while leading the Yellow Jackets to their ninth unbeaten regular season and their deepest playoff run since 2010. • QB/ATH Devin Black, Sr., Seffner Armwood – Either he could hurt you through the air or the ground, Black was the leader of the offense for the Hawks in their return to Orlando, passing for 2,265 yards and 25 touchdowns while rushing 425 yards and scoring six times on the ground. • RB Ty Dittmer, Jr., Gulf Breeze – One of three running backs in Class 6A to break the 2,000 yard mark this year, Dittmer was the only who helped his team reach the playoffs. Dittmer rushed for 2,089 yards while scoring 22 times. • DL Demetrius Mayes, Sr., Miami Northwestern – One of the most disruptive players for the Bulls defense, Mayes collected up 71 tackles and 11.5 sacks while helping the Bulls claim their first state championship in a decade. • LB James Miller, Sr., Seffner Armwood – One of the top linebackers in Class 6A, Miller did it all for the Hawks, collecting up 164 tackles, 44 tackles for loss, 11 sacks, 9 forced fumbles, recovering three fumbles, blocking five punts and two field goals. • Divadd Wilson, Sr., Miami Northwestern – Another key cog for the Bulls defense, Wilson, made his impact felt on the field with 30 tackles and intercepting seven passes.